In this application there are two parallel pedestrian aisles with a forklift cross aisle. 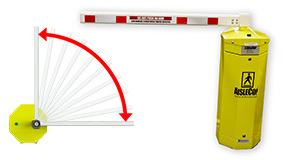 The AisleCop® system is configured to provide pedestrian priority, meaning that the pedestrian gates are always open to foot traffic and the forklift gate is closed unless triggered. When a forklift wishes to cross, its driver must activate the system with a pull cord switch. 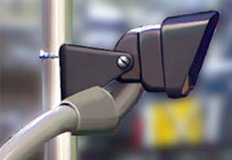 The system scans for pedestrians in both crosswalks utilizing motion detection. If pedestrians are detected, the system waits until they are clear, and then activates. If no pedestrians are detected, the system sounds an audible warning and flashes red lights to alert pedestrians that forklifts are about to cross. The pedestrian gates are closed simultaneously to block the pedestrian aisle and the crossing arm is raised to allow the forklift to cross. Once the forklift has crossed, the driver deactivates the system with the pull cord switch (this can also be done automatically with scanning). Once the closing sequence has been initiated the crossing arm will lower, and the pedestrian gates will close. The system has been returns to its "idle" mode.